Powdery mildew can seem like an intimidating hazard to your garden and landscape, but it does not have to devastate all your plants. By understanding more about this widespread disease, you can easily take steps to control it and keep powdery mildew from overwhelming your yard. Powdery mildew is a fungal disease that can infect a wide variety of plants. Several types of fungi can create this disease, which first appears as white or grayish-white fuzzy or powdery spots on the upper surfaces of foliage – as if leaves were sprinkled with flour or talcum powder. The mildew usually appears on the lower parts of a plant, but may appear anywhere, including on stems, buds, and fruit. As the infection spreads, the plant weakens, and the leaves may turn yellow or brownish, dry out or even curl up, twist or distort. Flower and fruit production will also decline, and this disease can have a grave impact on harvests. 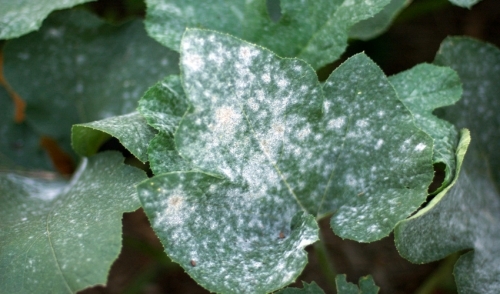 In extreme cases, powdery mildew can kill a plant, but that is rare. The fungi that cause powdery mildew thrive in warmer, humid conditions, but can also be found in drier climates. They can even spread to greenhouses or indoor plants, as the tiny spores that spread the disease can pass through window screens or other tiny openings. Powdery mildew most frequently appears in spring and fall but can be present at any time when conditions are right to foster fungal growth. More than 10,000 plants have been identified as being infected with different forms of powdery mildew, but that doesn't mean an entire garden or landscape will have trouble if the fungus appears. Because several types of fungus contribute to this disease, the different varieties usually do not spread to radically different plants. If one plant or type of plant becomes infected, quick control measures can easily keep it from spreading throughout the yard. Powdery mildew spreads through lightweight spores that easily travel along breezes or can be carried by contaminated gloves or garden tools. When powdery mildew is spotted in the yard, quick action is necessary to limit the infection. Removing and destroying all infected plants is critical, but the plant material should not be composted or else the spores can easily spread. Instead, the plants should be safely burned or carefully bagged and disposed of without spreading the contamination. Using appropriate fungicides is an effective way to control powdery mildew. Depending on the exact fungus causing the infection, applications of sulphur, neem oil or potassium carbonate can be effective at eliminating powdery mildew. Some home remedies, such as using diluted milk, whey or vinegar sprays, can also be effective for mild trouble spots. Whenever fungicides are used, however, be sure to read all application instructions and use the products safely and appropriately for the best results. Both the upper and lower surfaces of the infected foliage should be treated to ensure there are no lingering spores to restart the infection, and sprays should be repeated regularly to provide ongoing protection. The earlier powdery mildew is treated, the more effective the control will be. Spotting this infection right away and treating it promptly can mitigate any negative effects on the landscape or garden. The very best way to control powdery mildew is to ensure it never takes hold in the yard, landscape or garden in the first place. Fortunately, there are several easy, proactive steps every gardener can take to minimize the risk of powdery mildew. Water plants appropriately, and avoid overwatering that will create a more humid environment. Drip systems or soaker hoses are best to avoid excess water and humidity that invites powdery mildew infections, and watering in the morning will give plenty of time for excess water to evaporate and plants to dry out before evening. Opt for cultivars that are specifically resistant to powdery mildew, especially if you have dealt with the infection before. These plants are adapted to withstand the spores and will not help the infection spread as readily. Pruning plants to increase the amount of light and air in the foliage will help reduce humidity and make powdery mildew less likely to develop. At the same time, be aware of plants' mature sizes and space them appropriately to avoid overcrowding in the garden or landscape. Using preventative fungicides can help keep powdery mildew at bay, especially in areas that have been infected before. All tools, including pruning shears, should be disinfected between cuts to minimize the risk of spreading any possible contamination. Feeding plants a suitable nutrient diet will keep them healthy and strong, more able to resist fungal infections. Avoid over-fertilizing, however, which could create excessive new growth on the plant. Powdery mildew is more prevalent on new plant growth. Powdery mildew is a widespread fungal disease, but it does not have to decimate your plants. By understanding this infection and how to control it, you can keep all your plants safe and disease-free. We are a multi-faceted Hardware store supplying the central Adirondacks with custom orders, experienced staff, and a full-service graphics and apparel department. We have been the home of Lumberjacks apparel for over 20 years. Check back often as we will be promoting specials, discounts, and sales from all our departments. Our reputation of service to the community, home owners, schools, building contractors and surrounding villages in the Adirondack Park, stands proudly as we continue to provide you with great products, practical solutions, and custom services for all your home improvement needs. © 2019 Tupper Lake Supply . All rights reserved.